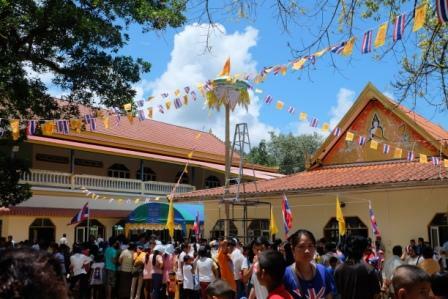 On the 23rd September, 2014, Sart Thai Day (Boon Daun Sib) festival was held at Kuraburi’s famous temple, Wat Pa San. 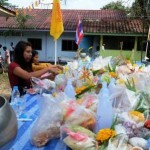 Sart Thai refers to merit-making activities for deceased relatives and loved ones. 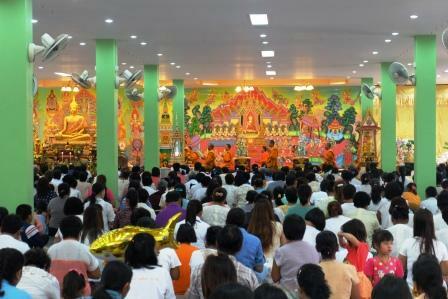 This event usually takes place in the middle of the traditional Thai year (some time during September). I was accompanied by Noon, one of the AD staff members and she helped explain to me what this whole festival is all about. It was my first time to witness this once-a-year Thai ritual activity. The monks that I have only ever seen on TV were now real and right in front of me! I got to see them up close (thanks to today’s modern camera zooming) and they were chanting and praying praying for hours. The festival was packed with local people from Kuraburi, so we saw almost everyone we know since Kuraburi is such a small town. There was also food, drink and toy stalls at the festival. One of the traditions is the preparation of sweet dessert, Krayasart. 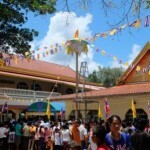 The Thai people will offer Krayasart to the monks in the temple for merit-making. They believe that by offering Krayasart, their ancestors will have food to eat and the person who gave it would be blessed. They are also shared amongst themselves as a sign of respect. Thai Buddhis ts see death as part of the life’s cycle and they believe there is a direct connection between life and death. They believe that who they are today is a result from their ancestors. 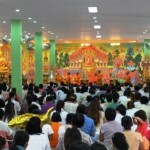 Thus, they give their ancestors special respect on this festival. They also have this bell in front of the temple that they will ring once the merit activity is done to acknowledge the ancestors and deceased people from above in order to give them their blessings. The Moken people were also there and they were sitting in row in outside of the temple where the local people will give them something. Thai people believe that if they do not give something to the Moken people, bad things will happen to them. One thing that I found so unique was the pole with flags. 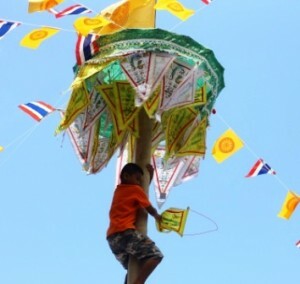 It is a competition game for the kids (usually boys) who can climb up the tall pole and grab one flag. Each flag has a different amount of money, some from which is donated by the local people. This game represents one of their traditions. The flags the kids won will be hung in their home and symbolizes protection.